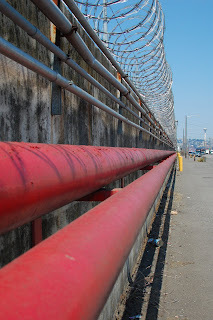 Here are water lines for firefighting, along the perimeter fence of Shell Oil Products on Harbor Island. This was an EPA Superfund site! Surface soil around here was contaminated with lead and arsenic from a previous smelting operation. That's been cleaned up, as has the petroleum hydrocarbon contamination occurring from more recent use of the site as a tank farm.